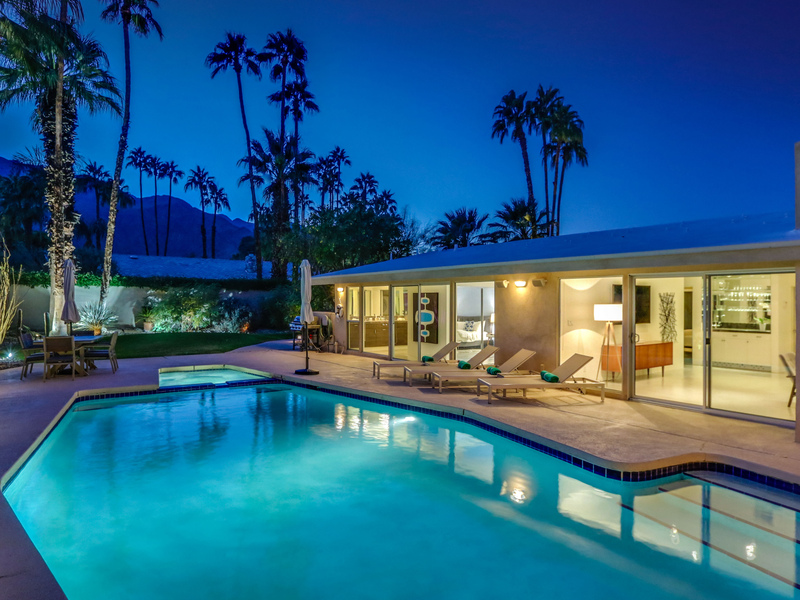 This Midcentury Executive Vacation home has been completely updated for the way we live today. 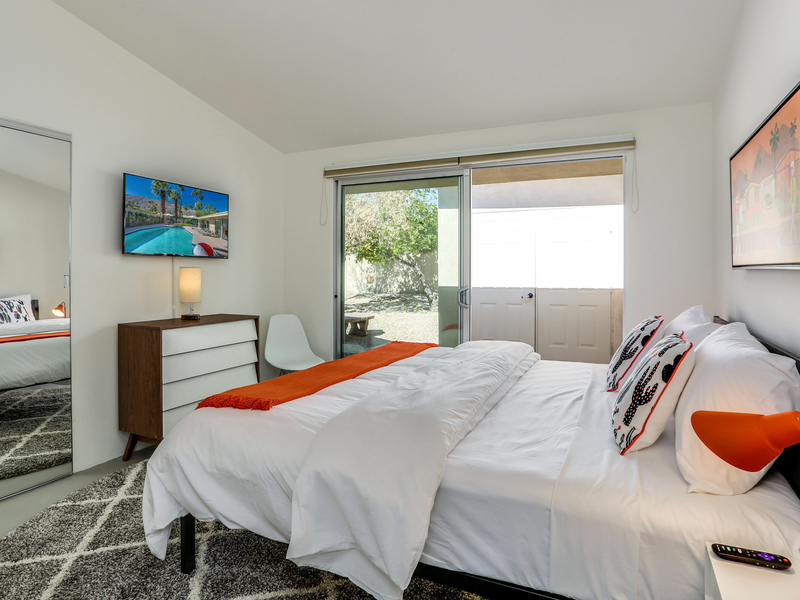 Gorgeous new kitchen, deluxe baths, upgraded climate control, high-speed internet, four flat screen televisions, comfortable Mid Mod-inspired furnishings, and fabulous sleeping quarters. One step inside and you'll know you made the right choice. 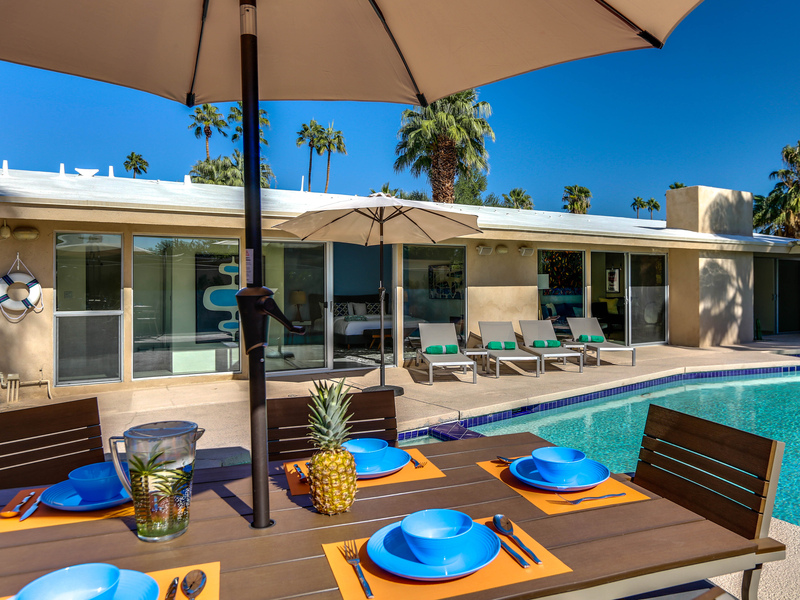 This high-style designer property captures the hip and sophisticated Palm Springs vibe of yesteryear. It is glamorously nostalgic and very 'next century' all at the same time. 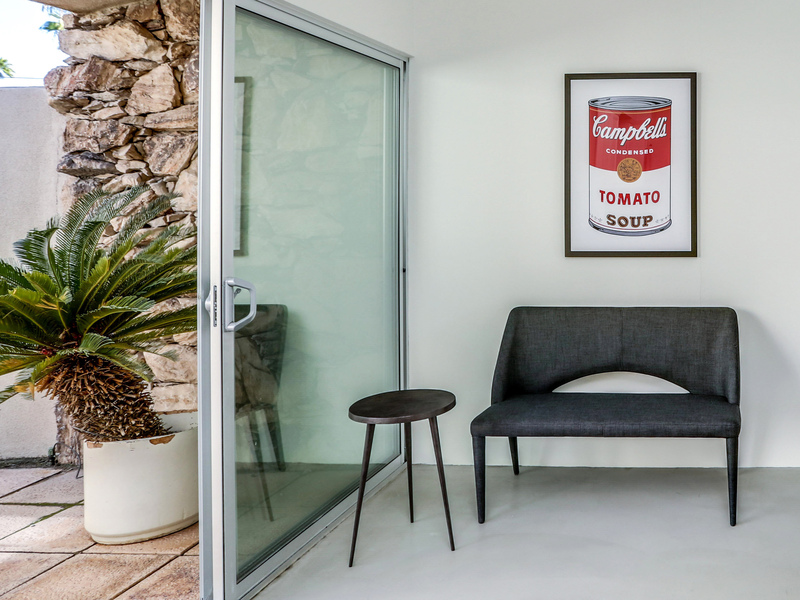 The focus here is on easy living in the sunshine - it's all about comfort, relaxation and blurring the lines between indoor and outdoor living. 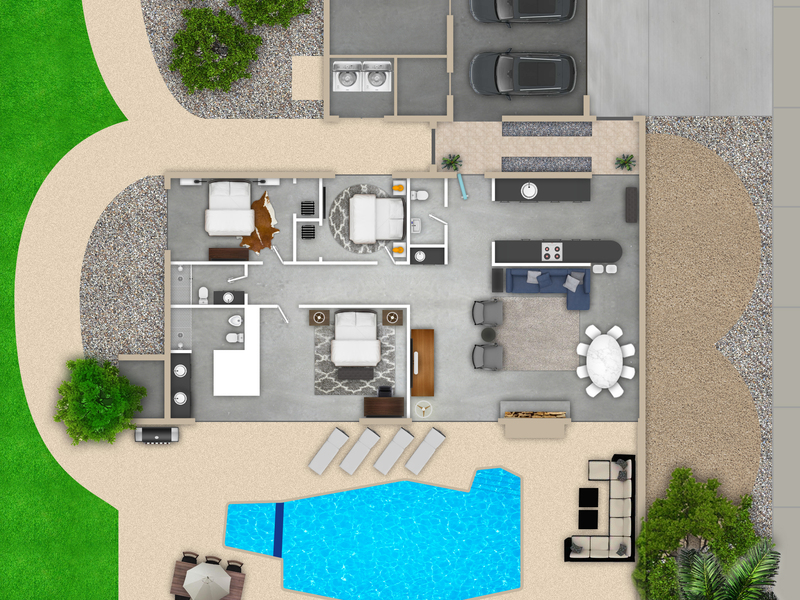 This is the type of laid back vacation home where you can put your feet up and not worry about a thing. 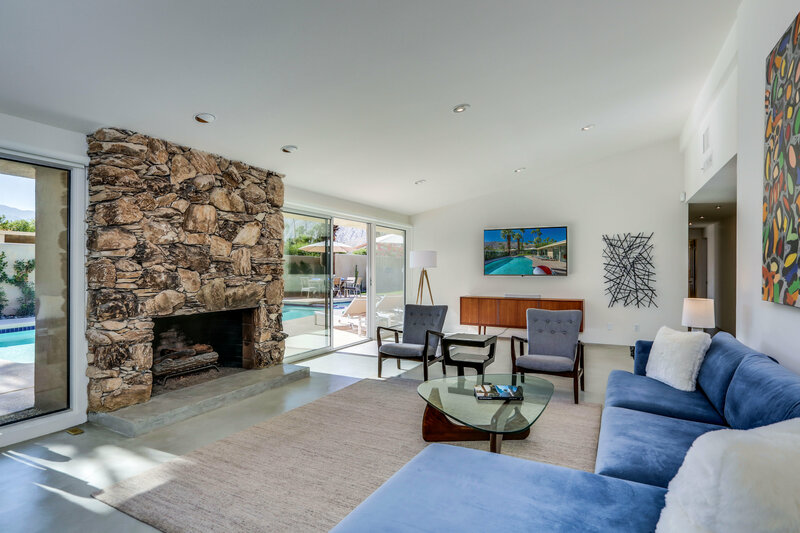 This sprawling single family home has a huge free flowing floor plan that is perfect for spending time with your entire group. 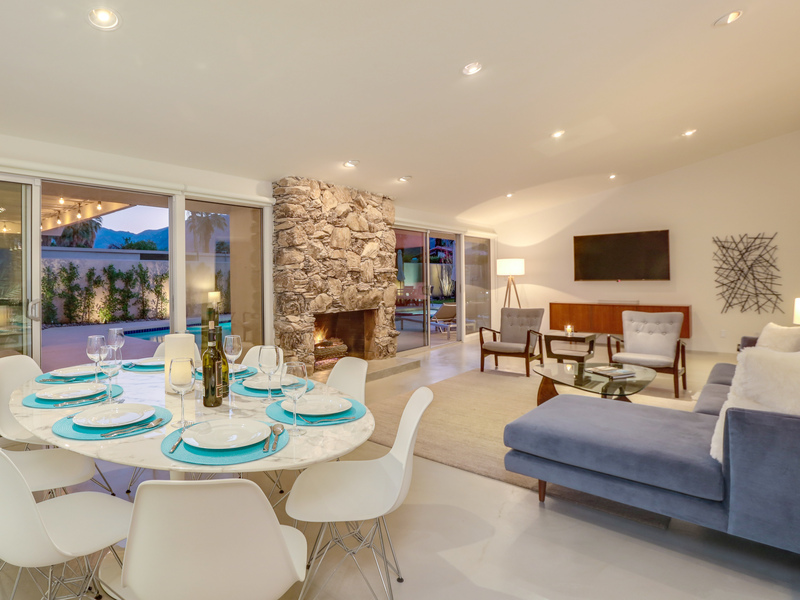 The living room, dining area and kitchen are open to each other - with walls of glass that reveal the fabulous pool yard. 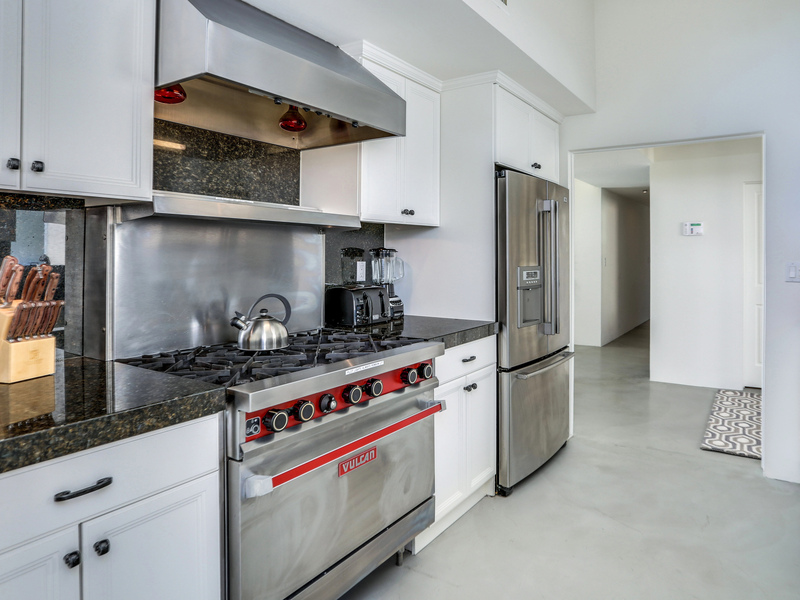 The fully-stocked chef's kitchen has gleaming countertops, and stainless steel appliances including a side by side refrigerator and a Vulcan gas range. 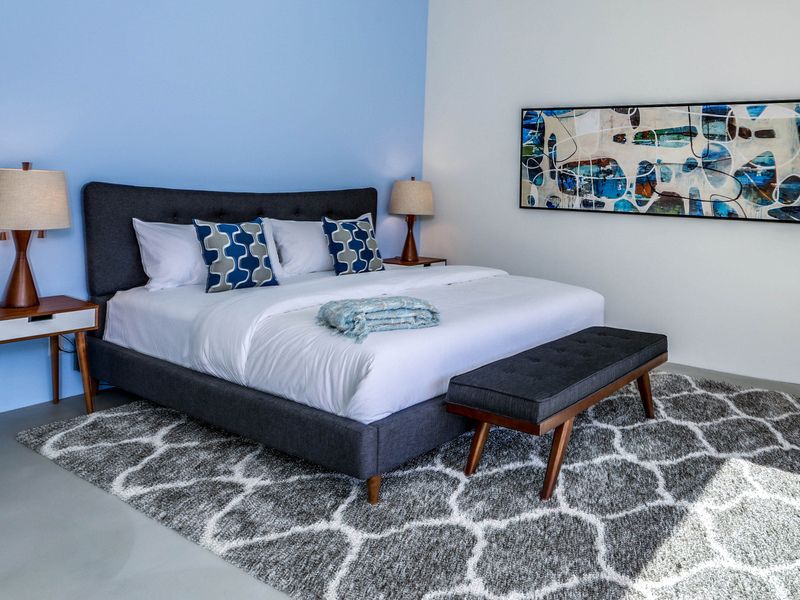 All of the bedrooms have the look and feel of an upscale boutique hotel and feature hospitality-quality King-sized mattresses, smart televisions and ample storage. 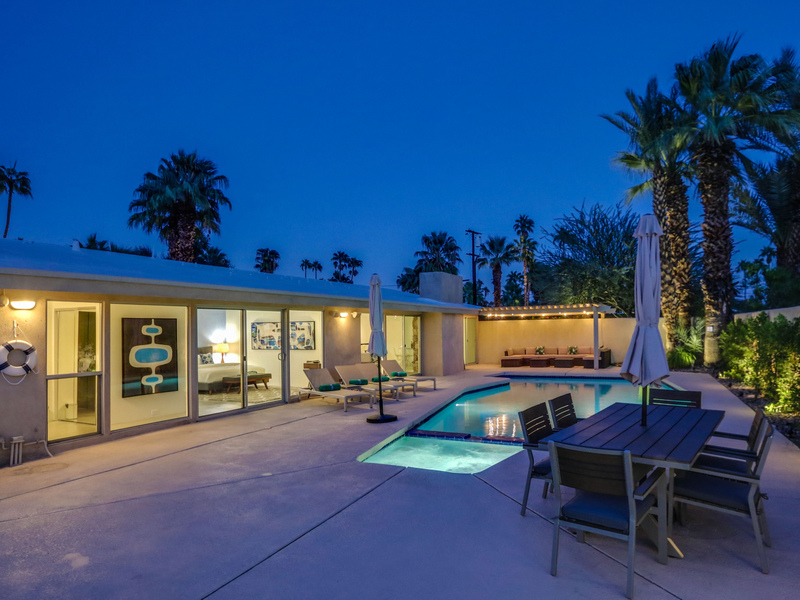 While the inside of this luxury vacation home is absolutely gorgeous, it is the very private pool yard and the magnificent mountain views that are the crowning glory. 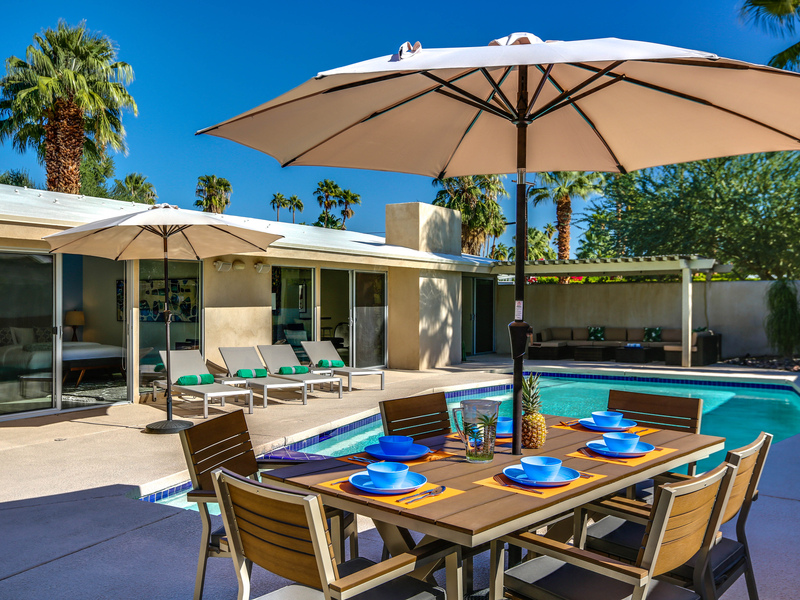 This property is beautifully landscaped and carefully space planned for spending time with your group. There are also more intimate spaces designed for some alone time to curl up with a good book. 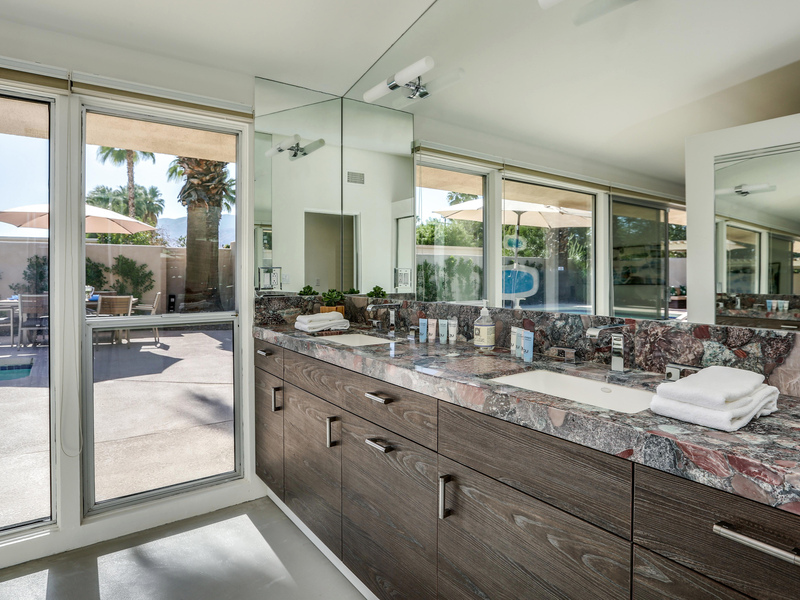 At the center of it all is the heated inground pool with its integrated spa. There is a gas plumbed barbecue - so you'll never have to worry about refilling the tank. 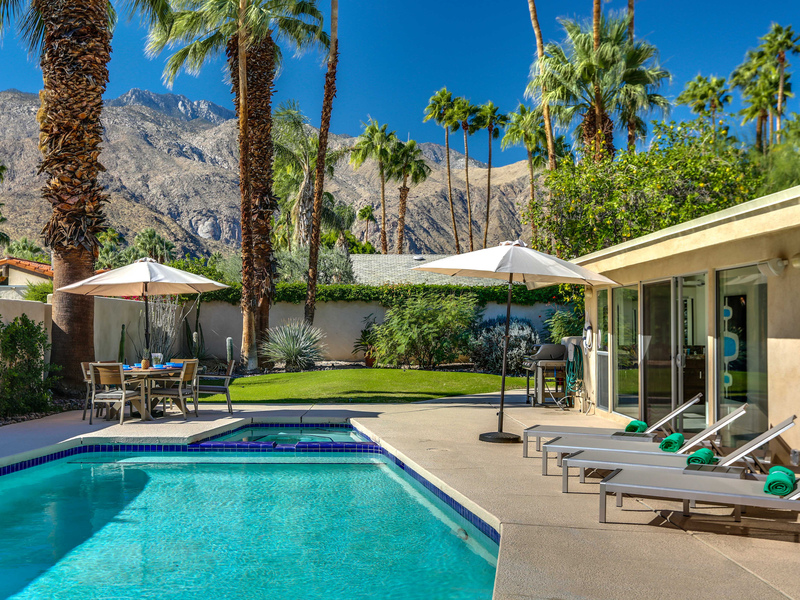 Poolside chaise loungers, an outdoor living pavilion, occasional seating, a fire feature, shade umbrellas and beautiful mature plantings give this property its quintessential Palm Springs vibe. 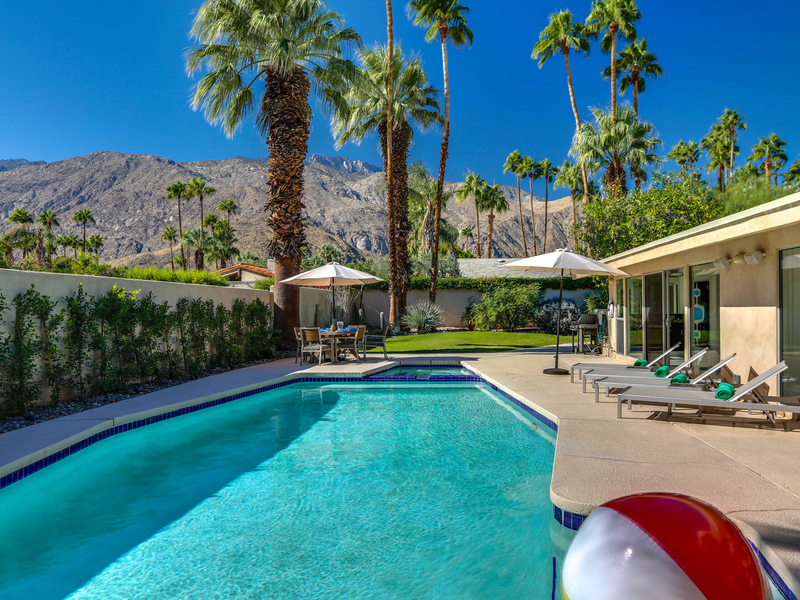 This part of the Movie Colony was originally included in the custom-designed Caballeros Estates created by Roy Fey, one of Palm Springs' most prolific developers and builders. 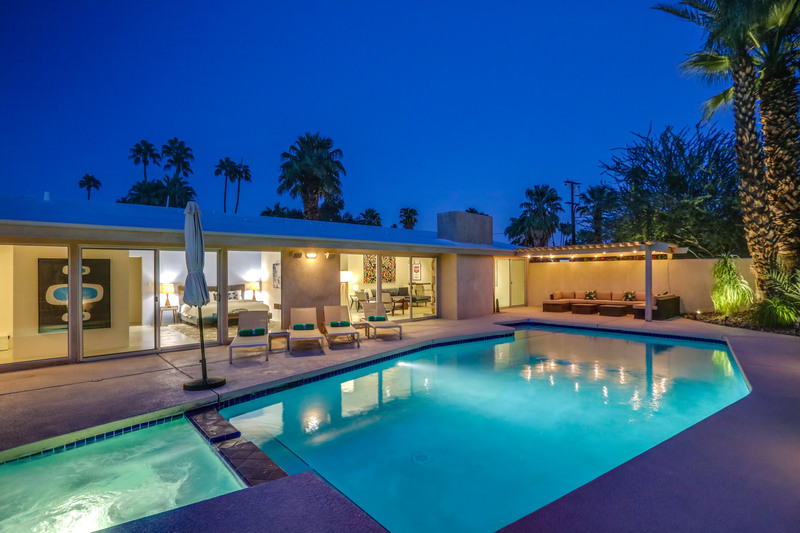 This particular property was built in 1960. 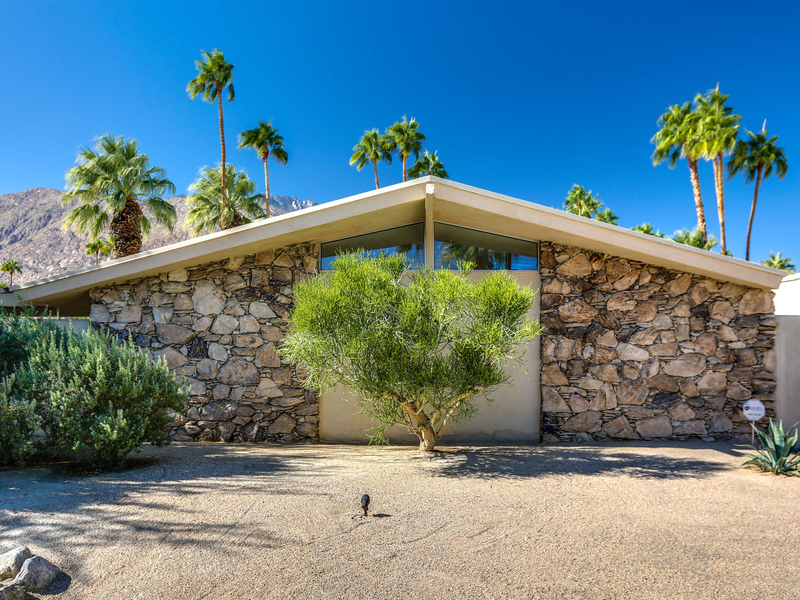 The 1959 Desert Sun ad for the opening of the development described "27 individually styled homes" by architects Wexler & Harrison. "I cannot say enough great things about this house. 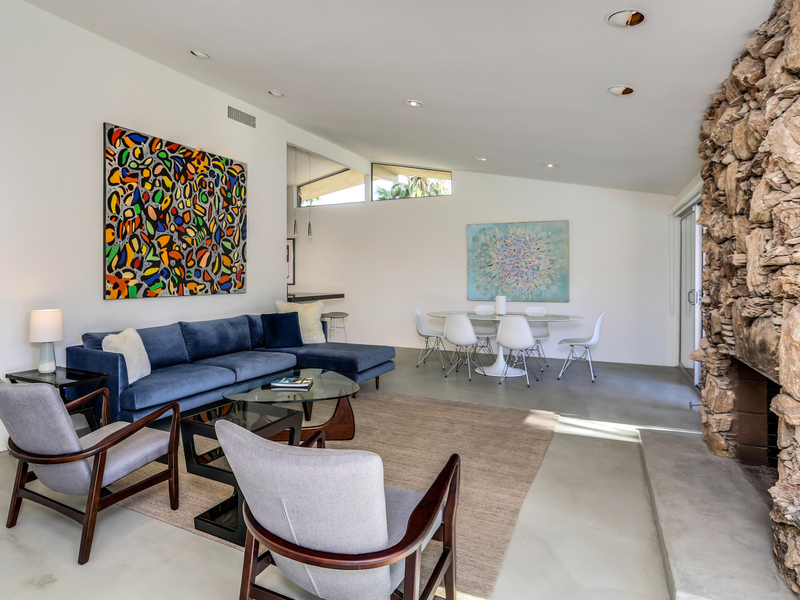 The beautiful open floor plan filled with chic and modern decor is stunning. 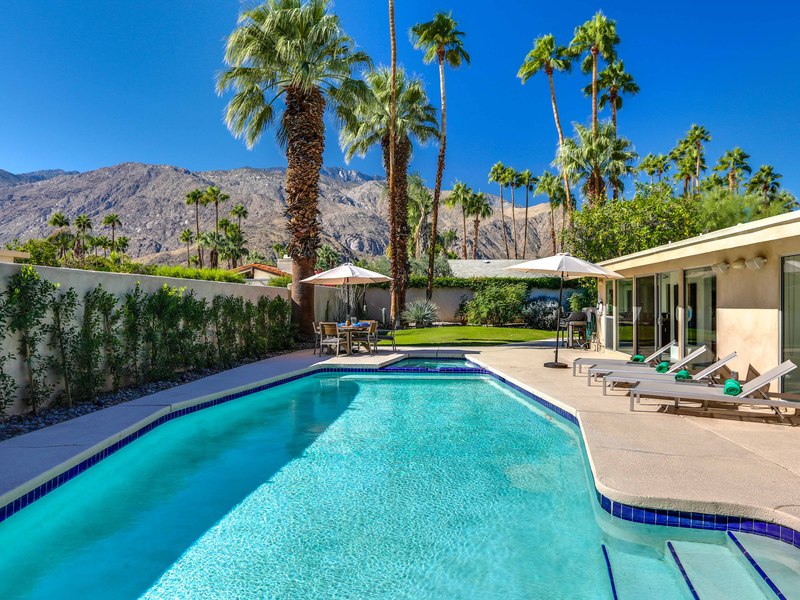 Upon entering the front door the view of the glistening pool will call you, so much that you may not even unpack your bags! This house had everything we could have possibly wanted and more. 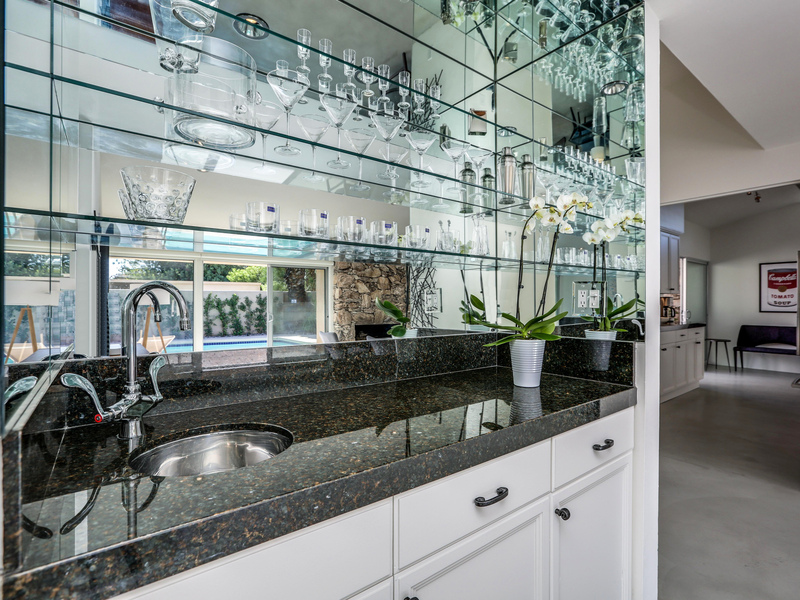 Beautiful kitchen, grilling area, great closet space, beautiful heated pool and spa, firepit and charming little fruit trees in the backyard. 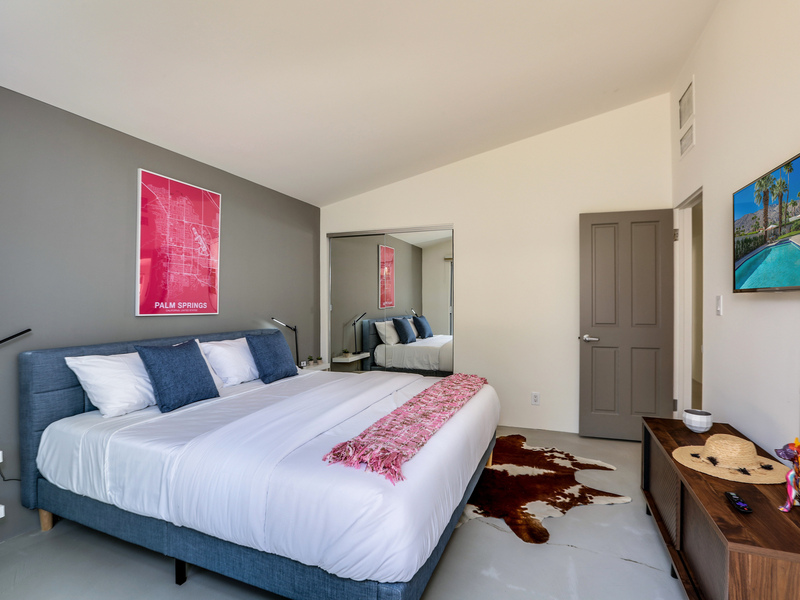 Everything is beautifully kept, comfortable furniture and warm design in the bedrooms. Sit in the backyard and watch the sun set over the mountains or the sunrise in the morning with your cup of coffee under the cabana. 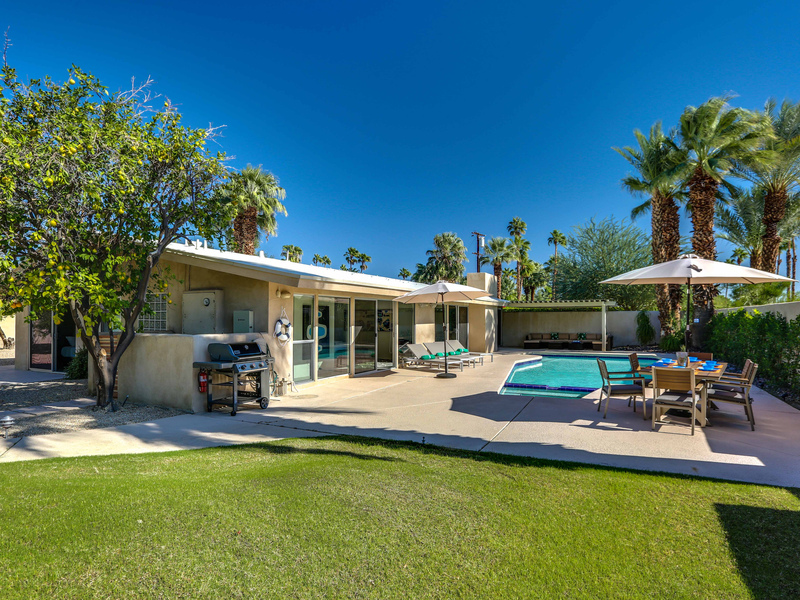 We loved how quiet it was there as well as how centrally located we were to everything in Palm Springs. We honestly didn't want to leave the house but when we did, we were so close to everything. The neighborhood itself was very walkable and gorgeous. Cannot wait to go back and stay here again." 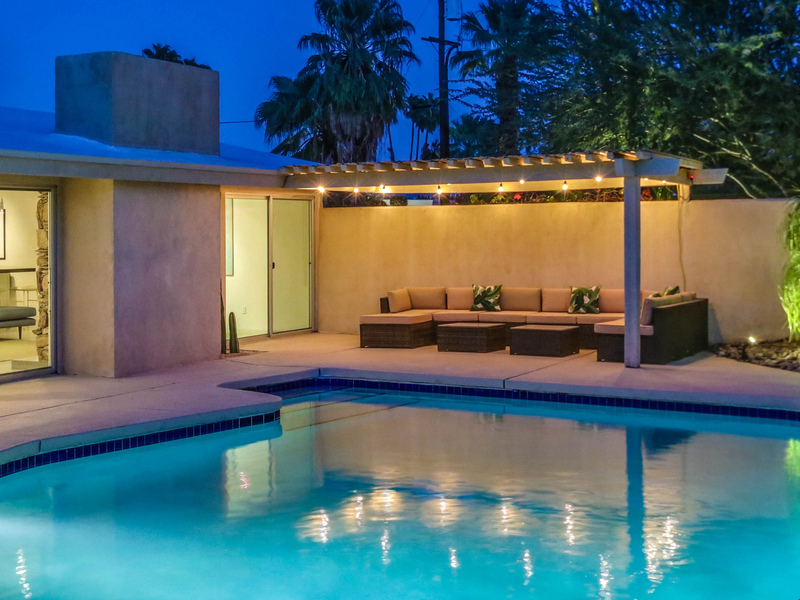 Gorgeous Mid Century Gem in Ideal Location! 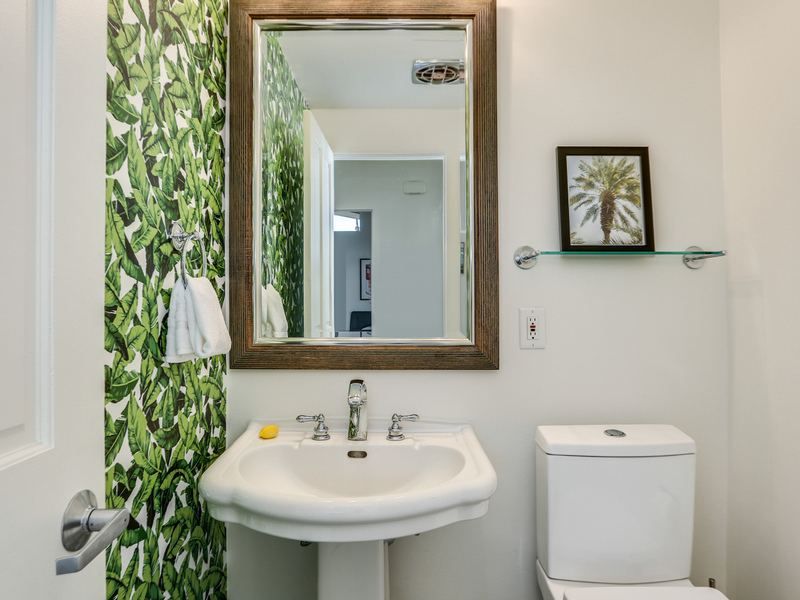 "We loved everything about our stay at Movie Colony Palms. 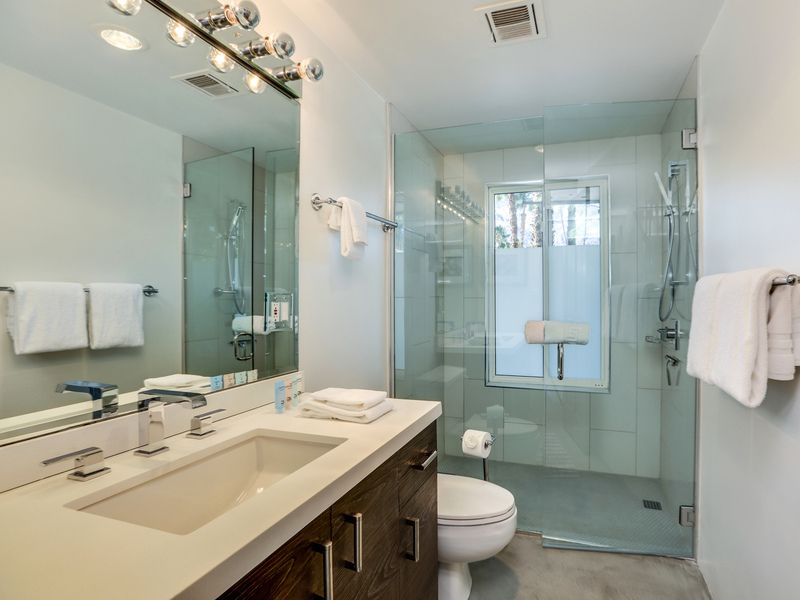 The home itself is immaculate, stylish and spacious with thoughtful attention to detail through and through. 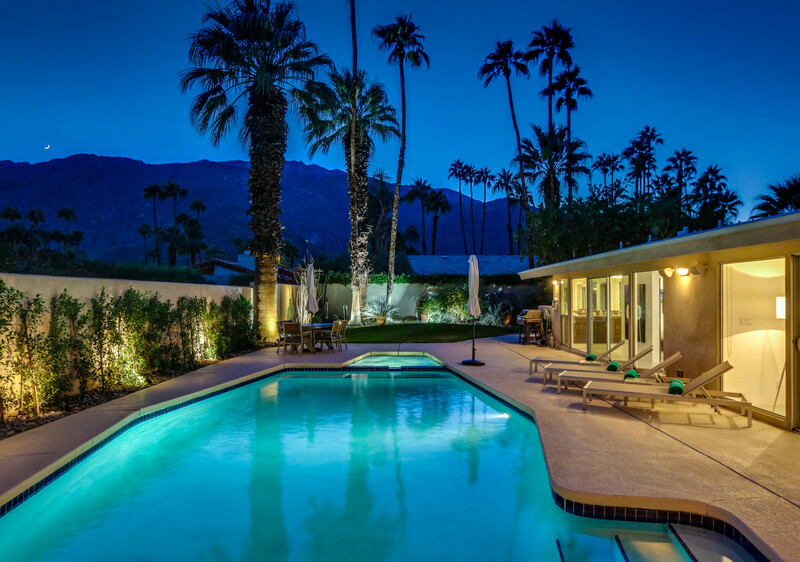 The weather was ideal so we spent most of our time by the pool and hot tub, both heated might I add, and the views of the San Jacinto mountains were like something out of a painting. 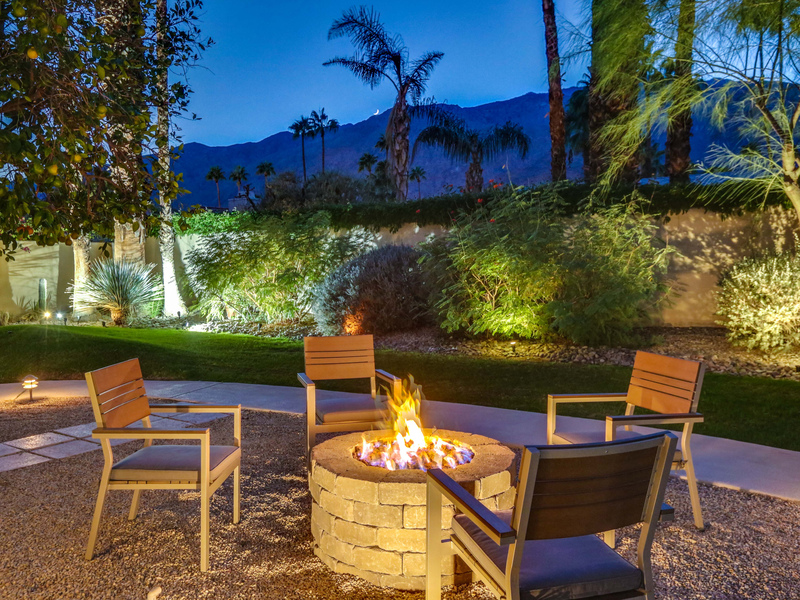 We loved how there are many spots to relax around the property - the fire pit, the veranda, etc. I loved the lemon trees. Additionally, the location itself is prime in the "Movie Colony" neighborhood - we were able to walk downtown for dinner within 15 mins. You could spend hours walking the neighborhood and admiring the lovely homes and gardens - quiet and very friendly. A fantastic experience overall! We can't wait to visit again! " 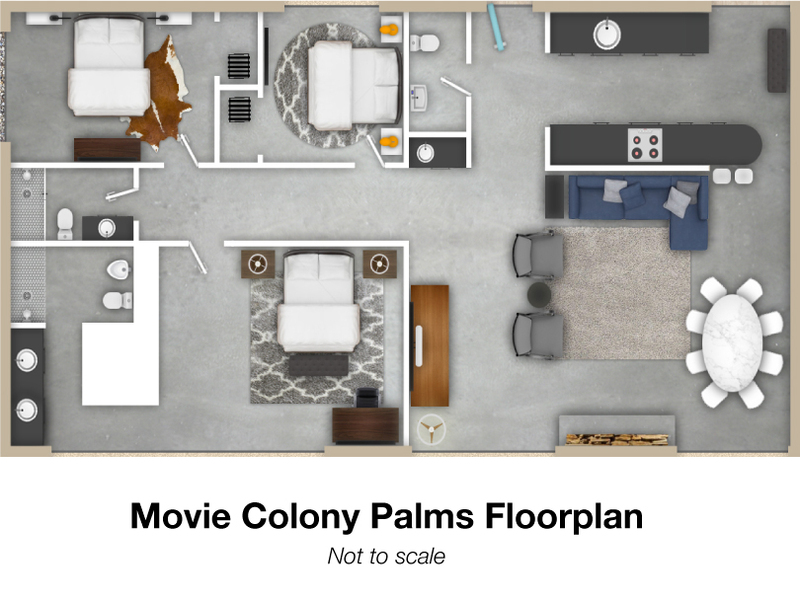 "Movie Colony Palms Is the kind of house that as soon as you walk through the door immediately invites you to relax unwind take in the beauty of the surroundings and ...exhale. 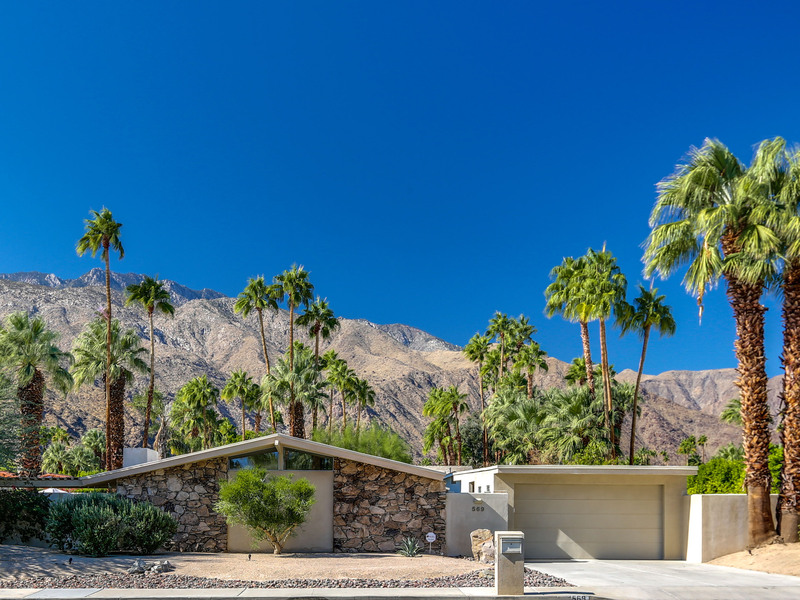 The gorgeous setting is truly perfect with the Mountain behind and the the elegant palm trees and myriad of fabulous fruit trees around every corner. The private gardens surrounding the glistening blue water of the pool and hot tub make you feel like you are in a movie! 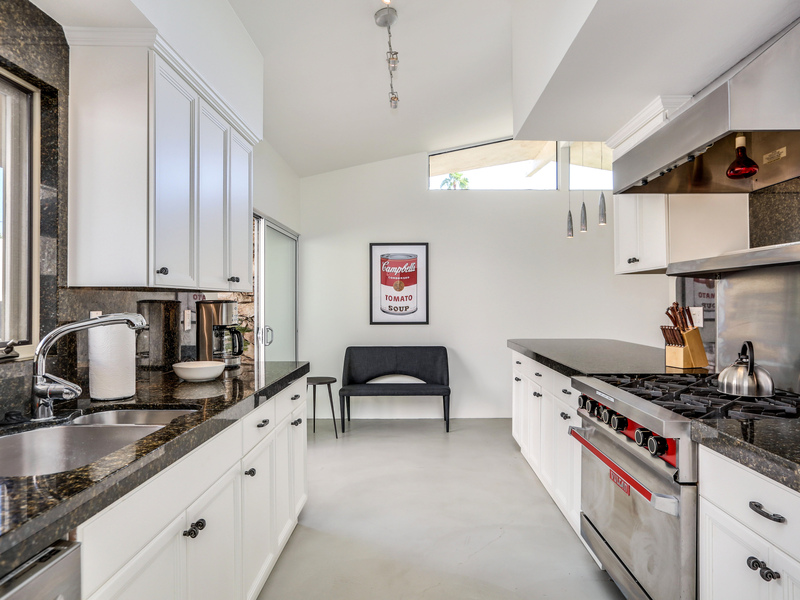 The sun waits for you in the morning and the built in canopy serves as a beautiful spot for that first cup of coffee. There you can plan your day of activities that are very accessible or you might decide to stay home in your own personal resort and watch the sun as it sets behind the Mountain. 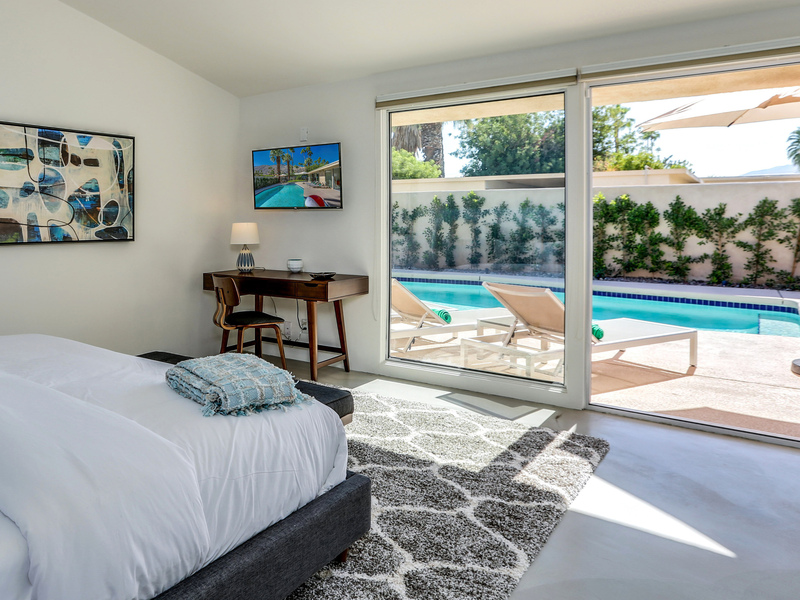 All the bedrooms are bright with charming decor good closets and a large state of the art kitchen. 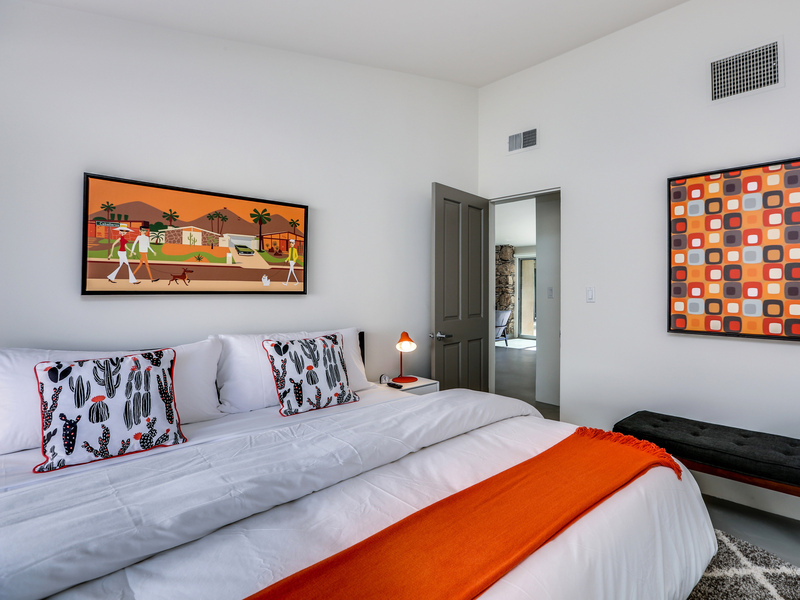 The crisp and beautifully kept home has an exciting collection of contemporary art. 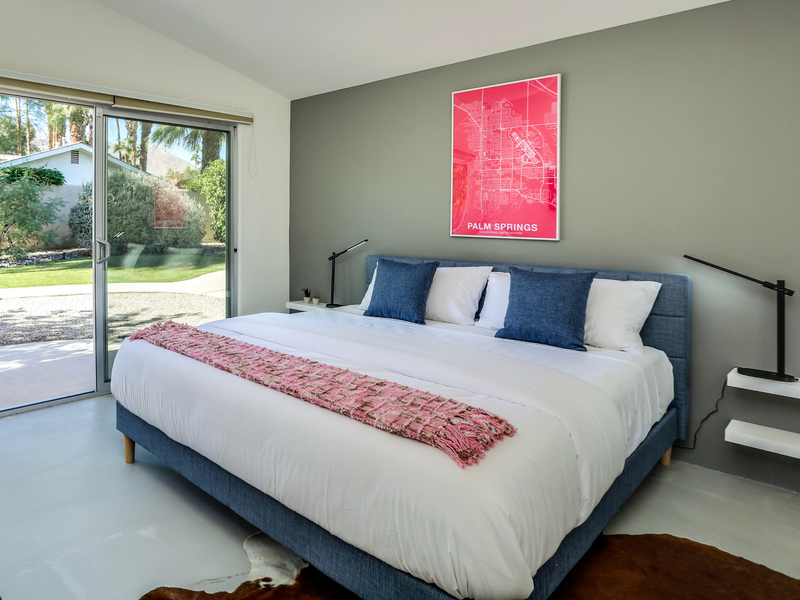 When night falls Palm Springs restaurants and roof top bars are walkable or just a short Uber or Lyft ride away. "